The New York Attorney General was pursuing a lawsuit against the charity, Trump and his three eldest children. 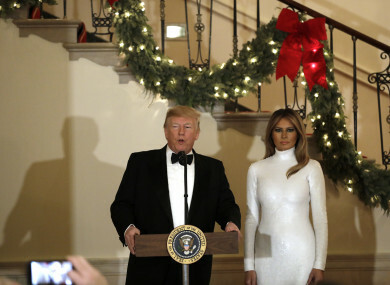 Donald J. Trump speaks as First lady Melania Trump looks on at the Congressional Ball at White House, 15 December 15. US PRESIDENT DONALD Trump has agreed to shut down his personal charity, the Trump Foundation, which has been accused of engaging in “persistently illegal conduct,” the New York attorney general has said. Attorney General Barbara Underwood said the Foundation would be dissolved and its remaining assets distributed to other charities. “This is an important victory for the rule of law, making clear that there is one set of rules for everyone,” Underwood said in a statement. President Donald Trump’s charitable foundation has reached a deal to dissolve amid a legal battle with New York’s attorney general. Underwood and the foundation filed a joint stipulation with the court today laying out a process for shutting down the charity and distributing its remaining assets to other nonprofit groups. New York filed a lawsuit last spring accusing the foundation of operating like an extension of Trump’s businesses and political campaign. That suit will continue. Lawyers for the Foundation say any infractions were minor. They say they have been trying to shut down the foundation voluntarily for months. A judge must still sign off on the agreement. Underwood is a Democrat and is seeking millions of dollars in penalties. She wants Trump and his eldest children barred from running other charities. © AFP 2018, with reporting from the Associated Press. Email “Trump agrees to close his charity amid accusations of 'persistently illegal conduct'”. Feedback on “Trump agrees to close his charity amid accusations of 'persistently illegal conduct'”.